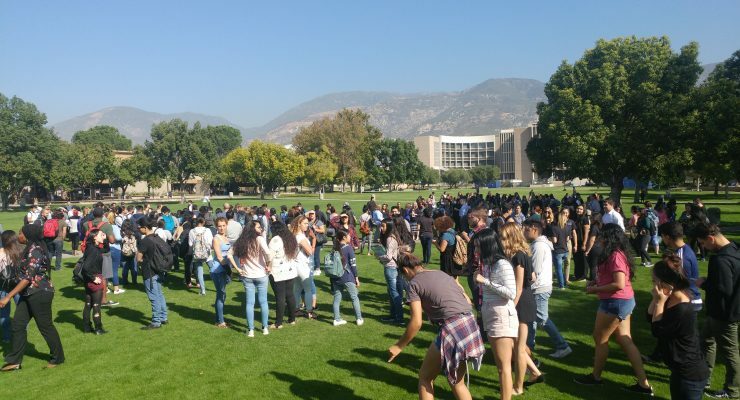 CSUSB participated in the Great ShakeOut, the world's largest earthquake drill, and evacuated hundreds of students and faculty within minutes. The annual drill was set for 10:19 a.m. on Oct. 19 and started exactly on time. Over the university's announcement system and via the emergency text line, students and staff were instructed to duck and cover. Minutes after the simulated quake, buildings were evacuated entirely. However, some buildings, like University Hall, had police officers go into the buildings to practice an emergency scenario and help facilitate the evacuation. Evacuees were led to open areas away from any structures where they awaited further … [Read more...] about Great ShakeOut!